Cables, Connectors & Signal Flow - Fail To Prepare, Prepare To Fail! Cables, Connectors & Signal Flow – Fail To Prepare, Prepare to Fail! 24 Aug Cables, Connectors & Signal Flow – Fail To Prepare, Prepare to Fail! Whilst there are more and more fantastic technologies available and the standard of audio visual production continues to rise year on year, we can occasionally find ourselves caught out trying to achieve a particular result. Common anomalies arise between digital and analogue signals, different screen resolutions and most commonly connector types. If I only had a HDMI connector instead of a VGA or how can I separate the audio signal from the image signal and so on. The best plan of attack is always to plan your connectivity, signal flow and distribution. Take the time to look at the connectors available on the display device. Look at the connectors on the source equipment is it DVD or Blu Ray? PC Laptop or MAC? VGA, HDMI, DisplayPort, or composite? Is there AV switching involved? Multiple sources on a single display? Is a distribution amplifier required? Multiple screens displaying the same contact? What are the cable lengths required? There’s a lot to consider and this guide to AV connectivity gives a bit more info. So what may a signal chart look like? It can be as basic or as complex as you like. Often a site survey of the venue may be required to double check cable runs and lengths. Don’t rely on venue information. Check and double check if required. When calculating cable runs allow for doorways and walkways. Remember cables wont go direct from equipment location to equipment location. For example, often a projector located 10 Meters From a laptop may require 30 Meters or more of cable. It goes without saying, booking an audio-visual company like ourselves, eliminates all of these concerns. A good AV company will take care of all these issues for you. Top Tip: A good AV company will know most function rooms in the country and will have been in them at some point. So you can benefit from a lot of hidden experience that may save you a headache or two! 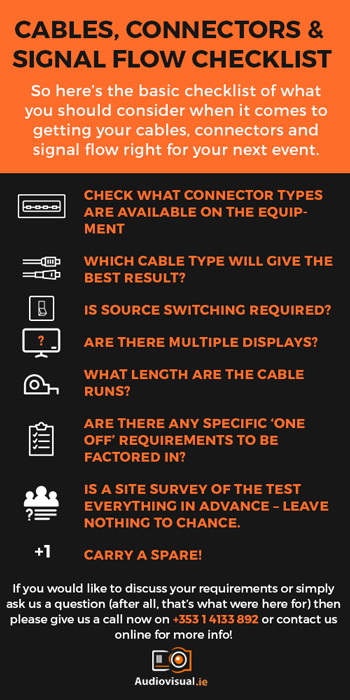 So here’s the basic checklist of what you should consider when it comes to getting your cables, connectors and signal flow right for your next event. Which cable type will give the best result? What length are the cable runs? Some cables will have length restrictions. Are there any specific ‘one off’ requirements to be factored in? Is a site survey of the venue required? Test everything in advance – leave nothing to chance. Remember: Fail to prepare, prepare to fail! We’ve done countless events all over Ireland and possibly have even done an event in the venue where you’ll be holding your next one! If you would like to discuss your requirements or simply ask us a question (after all, that’s what were here for) then please give us a call now on +353 1 4133 892 or contact us online for more info!